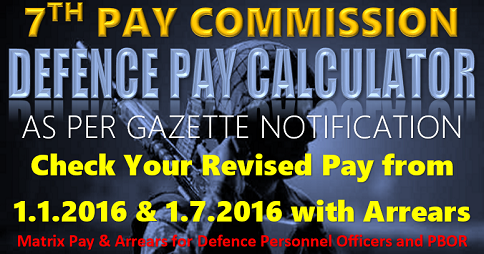 Sir mera besic+grade pay january 2016 ko 9260 tha par hamare department ne 7 pay commission ki sifaarish sep 2017 me laagu ki hai.tab mera besic+grade pay 9820 tha tho calculation jan 2016 se karni hai ya sep 2017 se please reply dena. I still dont understand about the central and state gov’t servants. Please tell me about it. Some says the central employees are enjoying 7th pay.. we the state employees are not getting any beneficiary of the 7th pay.. ???? 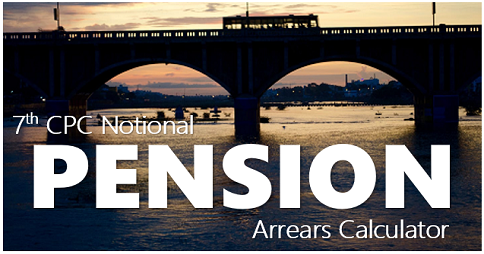 THE 7th c p c has suggested PENSION revision as follows. all the Pensioner to be given Pension on the formula of multyplying factor of 2.57 on immediate basis this is known as Option no 2 and is paid to all pensioner on last pension bases. 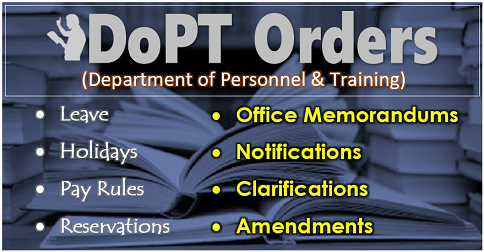 [ the 1st option is described as putting this pay in the pay MATRIX given by G.O.I. 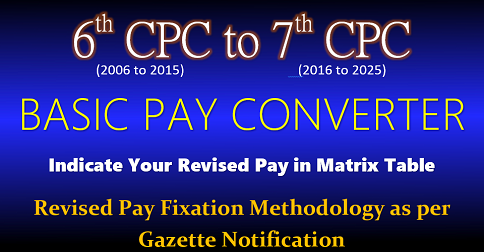 IN THE MINIMUM OF pay matrix and set to the nearby upper figure to min of PAY.]. 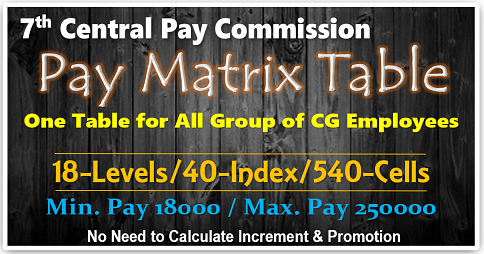 THIS MATRIX is designed in such a way that pay is multiply from 2.57 or 2.62 or 2.67 or 2.72 and lastly 2.77 depending upon each level and category. 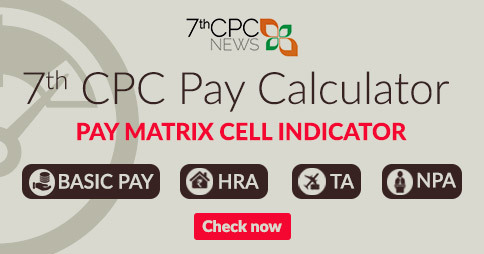 7th c p c has proposed to give the pensioner another OPTION of increment ,hence the person who has earned number increment to be counted and added with in the pay MATRIX , The column and Rows where meet is divided by 2 which will be your correct PENSION. THIS is 100% accepted by Government of India and no change can be done in by any administrative formula or calculators or CIRCULAR. 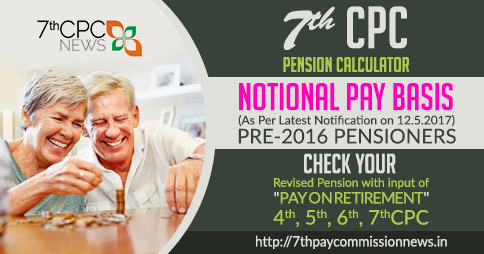 FOR ABOVE you are suppose to know the 6th C P C PAYBAND and GRADE PAY you were working lastly IN THE LAST PAY you have retired..
ALLthe pensioner RETIRED from 1-1-1996 onward and getting their PENSION normally knows or can be found out fro their PAY SLIP. THE pensioner who have retired prior to 1-1-1996 may not be knowing hence CONCORDANCE table is prepared to find out respective PAY BAND & GRADE PAY. AT the same time ALL above option are to be opted by PENSIONER ONLY and this choice is given to PENSIONER ONLY for BENEFICIAL PURPOSE. IN so many cases CONCORDANCE formula does not hold beneficiary as it does not reflect on the numbers of increment earned by Pensioner. and contrast to increment formula in this case . PENSIONER SHOULD BE GIVEN CALCULATION , SO AS HE CAN decide the his right choice. I am working as Loco Pilot -2 (s) , Is pay element added for calculation for D.A, H.R.A and other allowances?